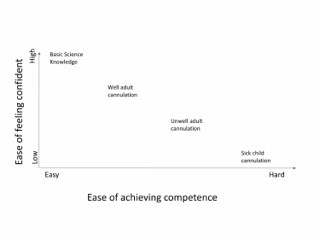 As part of my PhD, I assessed junior doctors perception of the terms “confidence” and “competence.” One of the themes that emerged was the challenge a junior learner has in assessing their own diagnostic accuracy for a particular clinical situation. It is much easier to make self-judgements on technical skills because they tend to be binary and unambiguous in their application (e.g., whether a cannula is inserted or not.) A decision-making process, on the other hand, which is dependent on a number of variables, requires a detailed description of what the participant should be able to do (Figure 1). 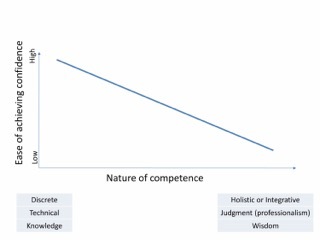 It is important to realise that perceived confidence in a skill may be related to the nature of the competency in question. I visualize this as an inverse relationship between the complexity of the task and the ease of confidence in achieving the task (Figure 2). Junior learners may recognize a patient is unwell, but be unsure of the required ongoing treatment (e.g. elements of resuscitation). Being aware of personal shortcomings in these complex situations demonstrates that the clinician is aware of a personal deficit in phronesis. Phronesis (or practical wisdom) is the ability to know when and how to apply knowledge to best help individual patients, a concept originally found in the writings of Aristotle. Recognizing competent judgement is vital during the evaluation of an education or practice intervention. The post-evaluation process must take into account the participant’s interpretation of ‘competence of judgement’ in order to be valid as an evaluative methodology. Finally, I realized the relationship between competency and confidence may also be context dependent. As a pediatric emergency physician, learning the anatomy of veins in the antecubital fossa for placement of an intravenous cannula is relatively straightforward. Placement of an IV in a very well adult with large veins is easier than in an unwell, hypoperfused adult, where the veins are less apparent. This is different again from a very unwell baby whose veins may not be apparent to the naked eye at all. Even experienced paediatricians would profess that a toxic neonate may be difficult to cannulate even if they are competent to do so (figure 3). Or perhaps I am lacking in confidence and competence? Dowie A. Phronesis or “practical wisdom” in medical education. Med Teach 2000 2000;22(3):240-241. Reblogged this on The Rolobot Rambles. An interesting & helpful dissection! It strikes me that another (largely) independent variable is the intrinsic self-confidence of the learner – which may, or not, be linked to self esteem. Perhaps this might be worth exploring, in addition to phronesis as an isolated entity?